The influencing of politicians, bureaucrats and the course of government policy is a billion-dollar business which is subsidised by taxpayers. 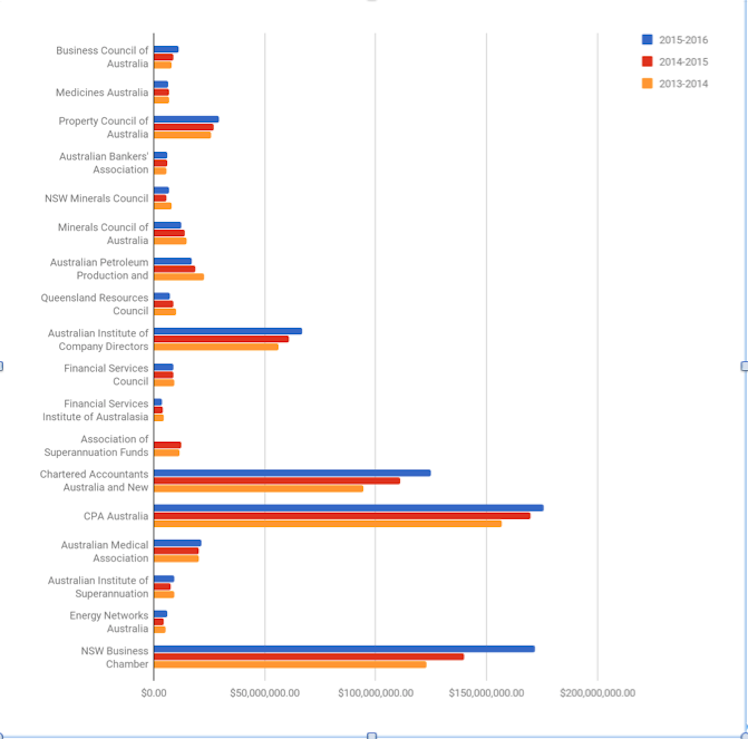 An analysis of the financial statements of 20 of Australia’s major business lobbies found almost $2 billion in funding by corporations over the past three years. This level of peak body funding indicates the substantial influence which the business lobby exerts over government policy. It is however only part of the picture; political donations and external government relations firms hired by corporations also affect political outcomes. * The analysis covered the financial statements of 20 business peak bodies. Together, their revenue surpassed $1.94 billion over the past three years. * Besides funding advocacy via their peak bodies, large corporations also have “in-house” government relations capabilities and communications teams whose role is to effect political outcomes. * Many large corporations also hire specialist government relations consultancy firms to lobby. This spending may sometimes be claimed as tax deductible. * Membership of business and professional associations is tax deductible. * Our analysis of 20 peak bodies is by no means exhaustive. Overall, peak bodies number in the hundreds. The analysis did not cover entire sectors such as food, retail, media, advertising and insurance. It covered only the major peak bodies in health, property, energy and banking and finance. * Like political donations, funding of peak bodies tends to rise and fall with the electoral cycle and with funding requirements for specific lobbying campaigns. * Many advocacy bodies receive government grants on top of their favourable tax status although these tend to be organisations which are not funded by large corporations. * Some of the top tier lobby groups representing big resources companies, pharmaceutical giants and the global oil majors – such as Minerals’ Council of Australia (MCA), Medicines Australia and Australian Petroleum Production and Exploration Association (APPEA) – are majority controlled and funded by foreign shareholders. * Many of the business peak bodies surveyed champion the same causes such as lower corporate tax rates and lower entitlements for workers. * Most big resources companies have multiple memberships. BHP for instance is a member of the Business Council of Australia, MCA, APPEA and the Corporate Tax Association. * The big banks also have multiple memberships and directorships of peak bodies such as the Australian Bankers’ Association, the Financial Services Council and other financial services peak bodies. * Many peak bodies also offer education and professional development services so advocacy is one part of their operation. * In most cases, the standards of financial reporting and disclosure are poor. The figures in the investigation depended on availability of data. We analysed some lobby groups over a longer timeframe in order to evaluate the trends in funding according to electoral cycles and campaign needs, and to see the growth, and in some cases reduction, in funding over a longer period. The major resources peak bodies were analysed over an 11 year timeframe, the Business Council of Australia over ten years, the Property Council over six years and most of the others over three years. Where the revenue figures were not available in the “top line” of the Profit and Loss statement, we used the operating cash-flow figures in the Cash Flow Statement. The bulk of the financial reports were “special purpose” reports designed to produce minimal disclosure, rather than more detailed General Purpose reports. Very few therefore disclosed the pay of key personnel. We failed to find the financial statements for some peak bodies such as Industry Super Australia (ISA), which was asked to provide them and declined. The analysis was focused on major peak bodies representing the interests of large corporations. There are hundreds of other advocacy groups which represent smaller causes and sectors of society and the economy. In health, for instance, there are literally dozens of groups, in many cases a peak body devoted to specific diseases. Most peak bodies record small surpluses or deficits in any year and some are sitting on sizeable investment portfolios. Others such as CAANZ, the Australian Medical Association, Medicines Australia and Pharmacy Guild have a quasi-regulatory role with their members as well as providing advocacy. Due to the relatively small number of peak bodies analysed here, and the in-house lobbying capabilities and spending on external consultants – there is no reliable way of evaluating the latter two factors – the amount of money deployed to influence politicians and policy-makers in Australia may be in the vicinity of $1 billion per year. If public relations were included in this estimate, shaping public opinion via media that is, the figure would comfortably exceed $1 billion. In keeping with good standards of disclosure and transparency – important in the case of peak bodies given their favourable tax status – some organisations publish their accounts on their websites. These include the Minerals Council, APPEA, the Property Council and the accounting peaks. Most don’t make them available. The project therefore required paying $38 for each set of accounts lodged with the Australian Securities & Investments Commission (ASIC). We made a number of observations from the notes to the financial statements, where there were government grants, for instance. The main purpose of this report however was to get a clear and accurate picture of the funding of these peak bodies. It should be emphasised that in the case, for example of the accounting peak bodies, more resources are spent on professional development than advocacy. These are advocacy bodies nonetheless and represent large corporate interests – they have significant lobbying muscle – and were therefore included in the report. The total revenue of the 18 organisations studied for the financial years 2013-2014, 2014-2015 and 2015-2016. POWER OF THE BUSINESS LOBBY. It is difficult to measure the influence of the lobbying industry. Some political decisions follow public campaigns and submissions to government inquiries. This influence can be identified. However, the level of influence of lobbyists over politicians is often hard to determine with any precision despite the Australian Government Register of Lobbyists. Most lobby groups issue regular press releases espousing their various causes, some prefer to pursue direct contact with politicians and other decision makers. All make submissions to parliamentary inquiries when it is in the interests of members. Most hold events, dinners and lunches which decision-makers often attend. These are often outlined in their public materials. Most seek an audience with politicians, state and federal and bureaucrats. This is anecdotal and direct contact is not published. The successful results of specific campaigns are sometimes evident. The Minerals Council for instance, thanks to an aggressive media advertising campaign, managed to oust an elected prime minister in Kevin Rudd, who was trying to impose an increase in mining taxes. It later emerged the corporate cost of deposing a prime minister was $22 million. This spending is evinced by the spike in MCA funding during those years when the lobby group fought higher minerals taxes. The nation’s premier peak body, the BCA, successfully – and along with other lobby groups and corporate voices – helped to garner government support for $50 billion in corporate tax cuts via the government’s Enterprise Tax Plan, which would reduce the company tax rate from the present 30 per cent to 25 per cent over ten years. Further to this, there is considerable overlap in the activities of many business peak bodies. Most campaign for lower taxes for their members and often lower wages or reduced entitlements for workers. It is often difficult to evaluate the impact of peak body campaigns with any precision though. Governments of both stripes have dithered for the past decade on introducing the second tranche of the Anti-Money Laundering/Counter Terrorism Financing (AML/CTF) legislation which would require lawyers, accountants and the real estate sector to disclose their sources of funding. The current Minister for Justice Michael Keenan continues to disclose only that the government remains in discussions with “stakeholders” over the legislation which was originally slated for introduction in 2008. The identities of these “stakeholders” remain hidden and the submissions and other entreaties of peak bodies is often undisclosed but it would not be surprising to find the property, legal and accounting peak bodies opposed the AML legislation. The Property Council of Australia, with its revenues of $20 million to $30 million a year is a powerful force for advocacy and has opposed measures such as the abolition of negative gearing which would make housing more affordable. The Property Council however is just one peak body in the property sector. It has corporate ties with the Shopping Centre Council of Australia. Others include the Master Builders Australia, the Real Estate Institute, the Housing Industry Association, Property Council of Australia and the Real Estate Institute of Australia. There is an important point about democracy to be made here: peak bodies operate on a tax-free basis, they are subsidised by taxpayers but are not compelled to make their submissions to government public so taxpayers can see what campaigns they are indirectly subsidising. Big Pharma companies use their peak body, Medicines Australia, to lobby government but their in-house capabilities and use of external lobby firms is extensive. It is hard to tell how much money is spent on government relations however as the costs tend to be buried in the “marketing” or “other” lines in their financial statements among other operating costs. The sector is highly active politically, as evinced by the growth in the Pharmaceutical Benefits Scheme (PBS). Australia’s drug subsidy regime used to be considered efficient by world standards. Just a few years ago it cost taxpayers $6.5 billion a year but this year the figure may approach $11 billion. In order to get a drug listed on the PBS, Big Pharma companies lobby the Health Department. Providing some idea of the financial muscle here, Medicines Australia has spent more than $20 million in the past three years but the chemists’ lobby is also active. The main peak body, Pharmacy Guild of Australia operates via separate entities in the states and territories. The NSW branch alone posted revenues of $11.6 million, $11.8 million and $8.3 million over the three years to 2016. It should be said that the Guild is not funded by big business, rather small business although, in addition to members’ funding, the NSW chapter also disclosed government grants of $3 million, $5 million and $4.1 million in those respective years. Further, its interests are often aligned with multinational drug manufacturers seeking subsidies for their products. Another smaller peak body in the health space, Consumer Health Forum of Australia Ltd showed government grants of $2.8 million in 2014 and $2.7 million in the prior year despite member subscriptions of just above $40,000. On top of these industry bodies, the health sector boasts an array of peak bodies, mostly charities, for most major diseases and even a number within broad disease categories such as cancer. These are mostly not corporately funded entities but they are often subsidised via grants and their tax status. Our analysis of 20 peak bodies – and there are hundreds – found $2.64 billion of funding over ten years. And most of the peaks were only analysed over three years. Yet the market in political influence in Australia extends well beyond peak bodies. Besides the peak bodies, the big corporations themselves typically have in-house government lobbying expertise. They also use external agencies such as communications group Newgate (which picked up a $2.7 million fee from the ABA last year), GRA Cosway, Crosby Textor, Hawker Britton, Capital Hill Advisory and Barton Deakin. On top of harnessing the influence of these advisors, companies regularly make donations to the major political parties. Property: this is the most generous for-profit sector with $64,099,161. Resources: The second most generous for-profit sector with $50,824,732. Alcohol: $2,996,153. These payments peaked in 2000 and again in 2013-14. These contributions have been rising steadily since 2008 as the PBS has increased in lock-step. Labor Holdings Pty Ltd: $40,995,000. Cormack Foundation Pty Ltd: $39,193,000. Queensland Nickel Pty Ltd: $21,664,196. John Curtin House Ltd: $16,108,830. Mineralogy Pty Ltd: $14, 692,636. The Free Enterprise Foundation: $8,856,612. 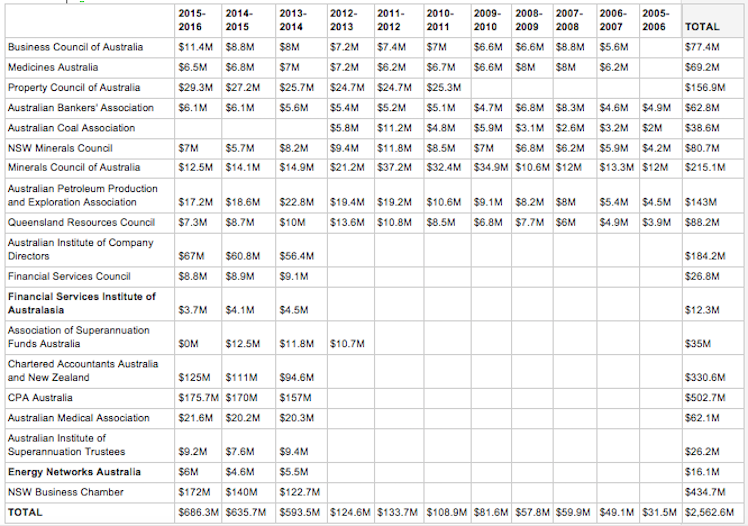 Canberra Labor Club Ltd: $6,177,191. Pratt Holdings Pty Ltd: $4,609,733. The totals for each year bounce around according to election cycles, spiking sharply in election years, and by virtue of specific donations which are targeted for specific outcomes such as killing the Resources Rent Tax. In 2014/15 total donations were $63 million but they totaled $114 million in 2013-14, an election year. Together with the financial muscle of the peak bodies, party donations present a powerful influence when it comes to shaping policy in Canberra and at state government level. Like political donations, the finances of peak bodies often shift around from year to year, especially when a campaign is required for political ends. So it was that the MCA revenues surpassed $30 million a year for the three years from 2010 when the organisation lobbied against higher mining taxes. For the typical peak body, the vast majority of funding comes from members. A small proportion comes from investment returns. Some of the top peak bodies are sitting on cash and “liquid ” investments of $10 million or more. Almost all the corporate peak bodies are in good financial shape and tend to run at small surpluses or small losses depending on the year. Very few have debt, apart from short-term financing and money owed to creditors in the year of reporting. In the case of the accountancy lobby, the two main players, Chartered Accountants Australia & New Zealand (CAANZ) and CPA Australia, spend millions on professional development and training. Both however are powerful lobbies too whose advocacy shapes the outcome of government policies on corporate tax avoidance and other key issues. CPA posted revenues of $175 million last year and CAANZ $125 million. Besides its financial capacity, CAANZ’s biggest backers are the Big Four global accounting firms, PwC, EY, Deloitte and KPMG. These firms enjoy substantial influence on their own account as their executives come to and from government in secondments; and they regularly advise governments. They are also the biggest beneficiaries of government funding for advice. Including advice to the states they may have picked up as much as $5 billion in fees over the past ten years from government mandates. While the NSW Business Chamber is not strictly an advocacy body in the traditional sense it has been included in this analysis because it is funded by business, is extremely well funded, promotes big and small business objectives and effectively influences government via the judiciary, rather than the legislature. NSWBC, which recorded revenues of $190 million last year, operates a law firm, Australian Business Lawyers & Advisors Limited, which fights unions and employee claims in the courts over the likes of penalty rates. It also enjoys charity status, received $5.8 million in government grants last year and has made a significant number of donations to political parties in past years. Given the influence which advocacy groups exert over the democratic process, it is disappointing to find low levels of transparency in the sector. Most peaks do not disclose their financial statements on their websites and when they do, the vast majority only disclose “special purpose” financial reports which are designed to reduce disclosure; executive pay disclosure, for instance, and full disclosure of related party transactions, are rare. While the leading resources lobby group, Minerals Council of Australia, oil and gas peak body APPEA and the Property Council of Australia disclose their financials on their websites, most of the statutory filings of peak bodies are only available by purchasing them from the Australian Securities and Investments Commission (ASIC). The BCA however, as well as one of the larger bank peak bodies, the Financial Services Council (FSC), do not publish a link to their financials on their website. Interested parties have to pay ASIC $38 for each set of “public” financial statements which, it could be argued, does not constitute “public information” as not everybody can afford to access them. We were unable to find financial statements at all for some peak bodies. The industry funds peak body, Industry Super Australia (ISA), which represents more than $220 billion of funds under management and the savings of five million Australians declined to furnish its financial statements and we were unable to find them on the ASIC database. The peak body for the big banks, the Australian Bankers’ Association (ABA), declined to provide its accounts. Neither are these filed with the corporate regulator but with the NSW Office of Fair Trading (ABA) instead. As befits a nation with one of the most profitable banking sectors in the world and a first-class carriage on the country’s biggest gravy train, superannuation, the banks are involved with a plethora of peak bodies. The principal and best known of the lobbies is the ABA. Though refusing to divulge its own statutory financial statements, ABA regularly gives advice to governments on how to conduct their affairs and holds forth about good corporate governance. Unlike most peaks, it does not file accounts with ASIC but with the obscure NSW Office of Fair Trading as it is registered under the Associations Incorporation Act. Its big bank members, NAB, CBA, Westpac and ANZ, each contribute $1.25 million a year to funding, Macquarie Bank pays $145,000 and small foreign operators such as Arab Bank pay as little as $10,000. Total revenue in 2016 was $6.4 million, and over three years $17.8 million, but this does not appear to be the full story. A news report in The Australian newspaper on August 3 this year said the lobby group spent $8.6 million on “special projects” over an eight-month period ending last February but this spending appears to be at odds with the group’s statutory financial disclosures. It is bigger than the annual spending in the accounts for each of those two years. The newspaper article also said the ABA had allocated $8 million to $10 million to fight the proposal by the government in South Australia to impose a $370 million levy on the banks (following the surprise $6.2 billion levy revealed in the Federal Budget in May). As the ABA fears other states might follow suit, it is spending big campaigning in South Australia. Whether this spending turns up its accounts may be another matter. The main costs, as with other peak bodies are staff costs, PR people, researchers and the rumoured $600,000 salary of new chief executive Anna Bligh. The banks are also major funders of the Financial Services Council (FSC) whose mission is to promote the retail superannuation providers such as Commonwealth Financial Services (CBA), MLC (NAB), ANZ Financial Services and BT (Westpac). Revenues for the three years to 2016 were $26 million. FSC is sitting on $12 million in cash and liquids. James Wheeldon, formerly a lawyer at ASIC, told a Senate inquiry in 2015 that a lawyer on secondment with the regulator from National Australia Bank had helped draft laws which were in the interest of the bank’s financial services division. Secondments to government are another major source of corporate influence and are often not well disclosed, if disclosed at all. He also said that ASIC relied on meetings with the FSC too when formulating policy and laws (relief orders) which would benefit its members. In addition to membership of the ABA and FSC, three of the big banks also have directors on the board of financial services professional body Finsia. Finsia recorded revenues of more than $12 million in the past three years. Then there is the Association of Superannuation Funds of Australia (AFSA), the peak body for all funds in Australia’s $2 trillion super sector: retail, industry and corporate. AFSA shows three-year revenues of $35 million. Another is the Australian Institute of Superannuation Trustees with $26.2 million in revenue over the past three years. Yet another in the space is the Self-Managed Independent Superannuation Funds Association (SISFA). 12,397 members had 115 events last year. It is energetically involved in advocacy and has booked revenues of $24.8 million over the past two years. Anna Bligh, formerly Premier of Queensland and now chief executive of the Australian Bankers’ Association. Ian Macfarlane, Australia’s longest serving Federal resources minister, is now CEO of the Queensland Resources Council. Former politicians Greg Combet, Steve Bracks and Peter Collins are on the board of Industry Super Australia. The extent of “revolving doors” between industry and government delivers industry significant influence and has led to substantial perversion of government policy over the years; the most notable examples are the failure of the electricity and gas markets to restrain prices. The peak body study did not include a number of peak bodies in the energy sector such as Australian Pipelines and Gas Association (APGA – which represents the mostly foreign controlled gas transmission oligopoly) and the Clean Energy Council (formerly Grid Australia) which represents the electricity giants and other energy peaks. One of the best-heeled of the peak bodies is the Australian Institute of Company directors. The 38,815 members of this not-for-profit tipped in revenue in the last three years of $184 million. AICD has a $22 million pile of cash and liquids and makes submissions to government on banking, workplace issues, regulation and government finance policy. Its central concern is combatting prospective reforms which would impose increasing liability on company directors. AICD provides education services as well as advocacy. Its accounts show government grants of $882,000 last year and $645,000 the year before. Salary bill is $26 million. Funding also came from KPMG, which is also auditor. The peak body is registered with under the Australian Charities and Not-for-Profits Commission Act 2012. This report was commissioned by GetUp!